Consider how one humble Anglo-Saxon poet can teach us about the ancient transition from the oral to written delivery of poetry. In recent study about the transition from aural to literary communication I came upon the following fascinating fact. As literate authors learned to assimilate oral materials to pen-and-parchment composition, and since cultural life and centres of writing were controlled so largely by the Church, it was inevitable that the oral transmission of pagan verse would die out, or at best leave few records of an increasingly precarious existence. Meanwhile the invasion of bookish culture into an oral tradition proceeded. I’ve read elsewhere that the names of a dozen Anglo-Saxon poets were recorded, although only four have any work that has survived. I understand, however, why Cynewulf is so well recognized—several thousand lines of his poetry are extant. You can access copies of his work for free at Project Gutenberg and Internet Archive. Curiously, we know no details about Cynewulf other than his name. This he included in his manuscripts, spelled in runic characters. Cynewulf’s poetry was familiar to the Inklings. In his diary during the 1920s, C.S. Lewis describes reading Cynewulf and Cyneheard while he bemoaned that Old English Riddles continued to represent an obstacle to him. I set to on my O.E. Riddles: did not progress very quickly but solved a problem which has been holding me up. [Henry] Sweet is certainly an infuriating author . . .
[Following afternoon tea, Lewis] retired to the drawing room and had a go at the Riddles. I learned a good deal, but found them too hard for me at present. J.R.R. Tolkien paid an unimaginable tribute to Cynewulf. He attributed to the ancient poet no less than the original inspiration for his mythopoeic conscience. In the summer of 1913 Tolkien . . . switched course to the English School after getting an “alpha” in comparative philology. 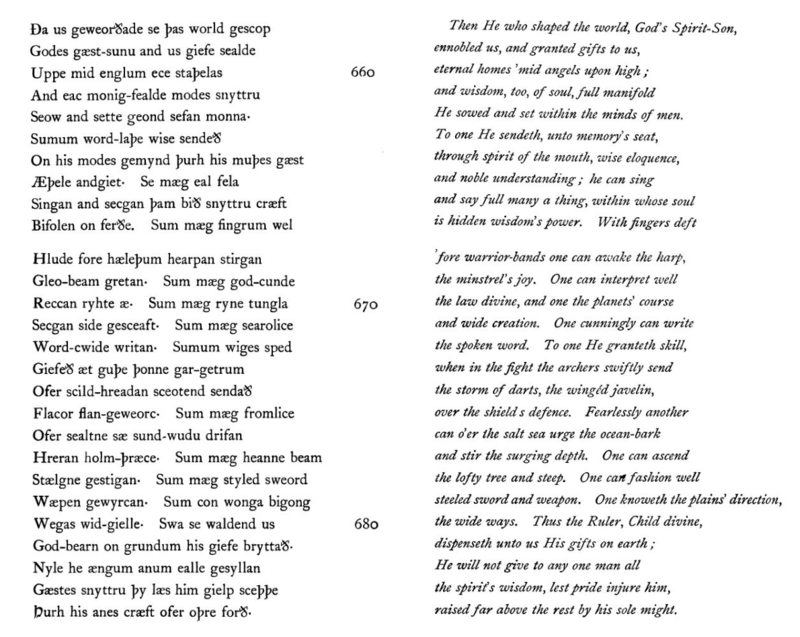 At this time he read the great eighth-century alliterative poem Christ, by Cynewulf and others. Cynewulf was an inspired poet. And, it is possible to discern some Anglo-Saxon words which have made it into contemporary English when passages are lined up, side by side. Enjoy Cynewulf’s celebration of God’s abundant gifts, extended to poets, musicians, and all others. He sowed and set within the minds of men. raised far above the rest by his sole might. ** From Tolkien and C.S. Lewis: The Gift of Friendship by Colin Duriez. *** This image is derived from the 1892 translation of Cynewulf’s Christ by Israel Gollancz. The lovely Anglo Saxon cross at the top of this page was discovered several years ago in the grave of a young teenage girl who had been buried near Cambridge. 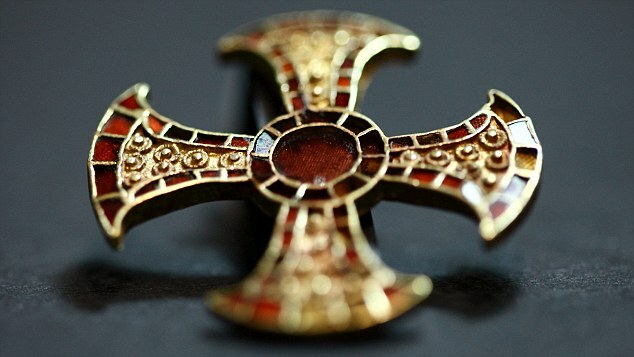 I have blogged about Anglo Saxon legacy in the past . . . here and here. I hope your readers enjoy it. You had my attention with the image alone, but I hardly know what to say of the rest. I know that I love it, and I am glad you posted it today. Like you, I find being introduced to new wonders like Cynewulf’s poetry wonderful. Glad that you enjoyed it. Have been reading in John Garth’s book about Tolkien (And the Great War) “celebrating the linguistic and cultural roots of ‘Englishness’, not wanting (or even mourning) the British Empire.” Tolkien wrote that “Literature shrivels in a universal language, and an uprooted language rots before it dies.” According to Garth he thought America’s fame after the Great War would make it universal, and this was not a good thing to Tolkien. Evidently he liked “little and local.” But the Empire itself did spread English everywhere. That certainly sounds like Tolkien. But the benefits of having a shared international language (English is well on its way to becoming that) are not insubstantial. Having met with pastors from diverse nations and language groups, I’ve been fascinated how English becomes the common ground among many for whom it is a second, or even third, tongue. language as common ground for pastors! thanks for the engaging idea. i had wondered if possibly the book might’ve been of interest to you in your calling.